6 TIAO Smart Sprinkler Pi is ON SALE! 9 Black Flash USB+ in stock now! 10 Black Flash USB+ in the works! 16 TIAO SPI Unlocker In STOCK! 23 AVR ATMEGA32U4 and Micro SD development boards are IN STOCK! 24 ELM327 Bluetooth/USB OBDII OBD2 EOBD CAN-BUS Code Scanner IN STOCK! 27 Liteon Switch (Patch) is in stock now! 34 Universal JTAG is now in stock! Looking for a DIY adapter to use your keyboard on your game console? We have just created an USB adapter for you. The adapter supports [GIMX], a free software allows you to connect your keyboard and mouse to your game console. We have the TIAO Smart Sprinkler Pi Ver 2 in stock now! We will stock TIAO Smart Sprinkler Controller (16 stations) in less than a week. Stay tuned, we are working on our ATMEL micro controller based sprinkler controller. Starting from today, we will be shipping out the next version of our popular TUMPA. The new version added SWD support! TIAO Smart Sprinkler Pi is ON SALE! Our TIAO Smart Sprinkler Pi is ON SALE! For only $45.99 you will get a 16 station sprinkler controller! Ever wanted to control your sprinkler system using your computer, tablet or smart phone? Now your dream becomes true. Input voltage: 22∼28V / 1A AC. Maximum current supply to Raspberry Pi: 500 mA. Input voltage: 5V-15V, from external source or through USB (when connected to a computer). Output voltage: 5V, up to 3A (! ), 3.3V, up to 500mA. 46 I/O pins (digital I/O), built-in pull-ups / pull-downs / open-drain on all pins. 9 PWM (for driving servos, DC motors, dimming LEDs, etc). 6 Pulse Input (precise pulse-width / frequency measurement). USB current limiting when acting as USB host (useful in Android mode). On-board LED under user control. As always, FREE SHIPPING to USA (USPS first class) and CANADA (Canada Post)! Black Flash USB+ in stock now! The Black Flash USB+ is an all in one solution for cable modem DIYers. It's pin to pin compatible with FlashcatUSB. Manual will be published in JTAG Tutorials section soon! Black Flash USB+ in the works! We will have them in stock very very soon! TUMPA-Lite is in production now. We have finished the prototype testing! TUMPA-Lite is a trimmed down version of our popular TUMPA adapter. It has minimal required bells and whistles for you to get your job done. TUMPA-Lite has one channel, TUMPA has two. TUMPA-Lite has no on-chip buffer, which means if buffer is critical for your application, then TUMPA-Lite is not for you, you need TUMPA. TUMPA-Lite only supports target voltage +3.3v, but it is +5v tolerant. If you need to support lower voltage, then use TUMPA, which supports +1.8V to +5.0V. 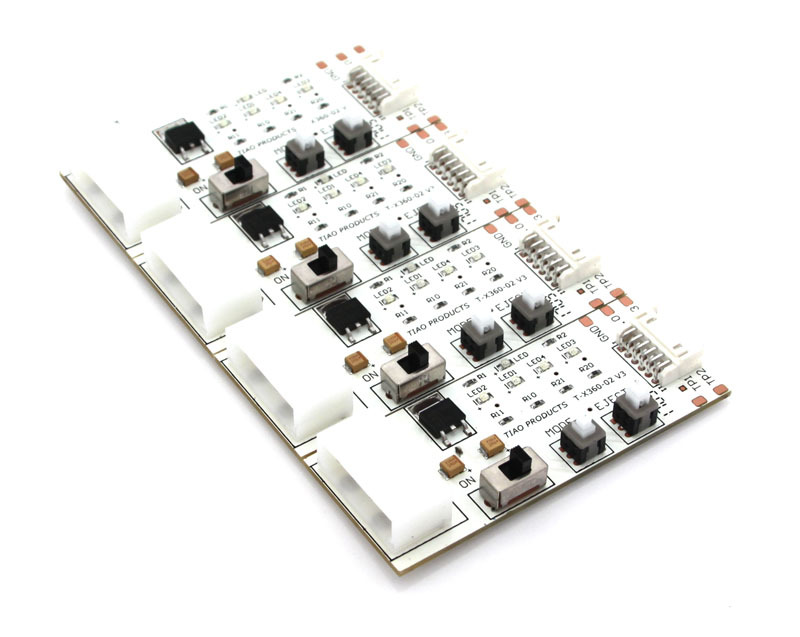 10 PCS Single/double layer prototype PCB for as low as $49.99 DHL/UPS/Fedex shipped worldwide! This is the V2 of our universal universal jtag adapter. We will be releasing the RGH kit for phat and slim very soon... the following is a 3D view of the board. TIAO SPI Unlocker In STOCK! The SPI unlocker is in stock now! Just a quick update about the unlocking tool for slim 360 DVD drive (Enable write mode on Liteon DG-16D4S (MXIC) DVD Drives, 9504, 0272, 0225 & 0401). We are working on it and it will be in stock in about 10 days! iPad 2 is so hot now, why not buy a case or screen protector to protect your cool gadget? All our products are premium quality. We are now offering smart case enhancer (to use with Apple smart cover), anti-glare matte finish screen protector and leather case. This is the latest version of our upcoming Multi-Protocol adapter. It supports JTAG, SPI and I2C. Support target board from 1.8v to 5.0v. VT-SEL: Config whether the buffer chip is powered by target board or internal 3.3v voltage. Jumper on 1-2, power the buffer chip with internal 3.3v power. Jumper on 2-3: power the buffer by target board. Buffer_en: Jumper on 1-2: Enable/disable buffer chip by ACBUS3. Jumper on 2-3: Buffer is always enabled. Auto_pwrdown: Jumper on 1-2: On board RS232 voltage translator is always on. Jumper on 2-3: On board RS232 translator is enabled by PWREN pin of JTAG Chip. The previous probe requires you to cut the pcb in order to obtain the key, especially 8 and 9 series dvd drive. Thanks to POGO MO THOIN probe, the latest addition to the probe family, with this tool, you no longer require to cut or solder on your PCB, which makes everyone can do this at home! This is the revision D of our FT2232H based high speed JTAG board, the software is currently being developed by tjtag author Tornado. AVR ATMEGA32U4 and Micro SD development boards are IN STOCK! We have stocked the ATMEGA32U4 and Micro-SD development board! ATMEGA32U4 development board for rapid AVR Micro SD adapter development. This AVR development is powered by an ATMEGA32U4 that is pre-programmed with the AVR's DFU bootloader which allows code to be programmed inside the chip without any external programmer, just download the FLIP software from Atmel's web site and load your HEX code via your computer's USB port. The board is shipped without firmware, thus you can directly plug this to your computer and load your HEX code using FLIP software. If you need to re-program the chip, all you need to do is to press the RST button and release it to enter bootloader mode. This board also has a built in Micro SD adapter, which is connected to ATMEGA32U4's SPI interface, thus you can write your own program to read the content of your micro SD. ELM327 Bluetooth/USB OBDII OBD2 EOBD CAN-BUS Code Scanner IN STOCK! Do you want to pay $100 for ONE code read at your dealership? Say NO to that, for half of that price, you can own your own code scanner and read / erase code thousand time! Wireless or USB Interface, Read & Clear Generic and Manufacture Specific Codes, Monitor Status, and Retrieve VIN Data! CANBUS Support! We will be stocking FTDI based USB JTAG for your wirless router, stay tuned! Liteon Switch (Patch) is in stock now! We have just stocked TIAO Liteon Switch 2.0. You only need to solder 5 points. Tutorial will be published soon. We are also working on a Liteon Patch (LT Switch), which allows you to solder it on your liteon dvd drive, so no need to rejoin the trace and no need to hold the pogo pins to get the key. The adapter will be available soon. We know you you like our 360 USB NAND reader. We are now stocking a solderless adapter for our NAND reader/write, with this adapter, you no longer need to solder 7 wires to your xbox 360! (you still need to solder diodes). The adapter will be available in 1 week. We are proud to announce that we will be offering Arduino hardware. We are very glad to announce that our affiliate program is open to public! If you own a website or blog, why not earn some extra cash? Just add our banner/link to your site, that's it! Your send us customers, we send you money! For every purchase you drive to us, we will pay your 10% commission! For a limited time, you will receive $10 sign up bonus! Join us affiliate program is complete free! Click here to join our affiliate program and receive $10 sign up bonus instantly! Universal JTAG is now in stock! We have received the first shipment of our latest JTAG adapter: Universal JTAG. This version works with wireless routers, cable modems, FTA/SAT receivers and XBOX 360s!. This is a real universal JTAG for all your devices. It also comes with male to male flexible cables! We have redesigned the all in one JTAG board, it is now universal JTAG board, works for XBOX 360 too! We have sent the files to the PCB manufacture, we expect to receive the prototype in 2 weeks! Stay tuned! We have received the prototype board of the new All in One JTAG adapter. This version will work with Router, Modem and FTA/SAT receivers. This is a real all on one JTAG for all your devices. We hope to release asap. http://www.EASYmG.COM has finally opened the door! Our latest products will exclusively available on http://www.easymg.com for a month. This includes the HDD Shell for XBOX 360, new version of the DVD power adapter and USB version of the key extractor... they also have a 20% off coupon (order $10 or more), easymg.com, valid until end of May. BTW, free shipping to USA and Canada too! Check out their great selection today at http://www.easymg.com! We know you are desperately trying to find a VT6421a powered Cardbus without much success. We're pleased to announce that we have developed a VIA VT6421a powered Cardbus PCMCIA to SATA card for your XBOX 360 projects. It's exclusively available at http://www.easymg.com for a price of $26.99 shipped to your door. We are so excited to announce the next version of TIAO's USB version of the key extractor. Since the release of our serial version of the key extractor, we have received many inquiries about the USB version. Now we are so proud to announce that the USB Key Extractor is in stock! You don't need a serial port anymore. You can extract your Liteon key as easy as 123! We now have the HDD Connector in stock now. TIAO's HDD connector is not a simply cable or adapter, it is a fully functional HDD shell identical to the original ones from MS. See the attached picture. The retail price will be around USD $30. Adding the price of a WD1200BEVS, total will be under USD $100, compare to MS' price, you cannot ask more! Please check this page daily for stock update. You asked, we listened. The new version of the power adapter features a power on/off button. They are in stock now! Please check this page daily for stock update. Do you own a XBOX 360 Arcade? If you do, you may soon realize that you cannot play many games because of the limited space on your arcade. Without a hard drive, you cannot play HALO 3 or GEARS OF WAR. Without the hard drive, you cannot save demos, game trailers, movies, stream music, view pictures... you are missing a lot fun! Unfortunately, a 120G HDD for xbox 360 will cost your $150! No kidding! A 120G notebook HDD only cost $45! What an expensive HDD! Why don't we make a SATA to HDD connector for your arcade? Which allows you to connect a SATA notebook sata HDD to your arcade? We are now in the process of designing the connector... a prototype will be made soon! SP12 is a low cost AVR programmer. However it requires a parallel port. If your machine doesn't have a parallel port, then you cannot use SP12. The USBtiny ISP AVR programmer is a very low cost AVR programmer works great with AVRDude, which is compatible with AVRStudio. The firmware is open-source and released under GPL. We are designing the PCB now. A prototype will be made soon! This page was last edited on 27 April 2016, at 19:36.